For many homeowners, HVAC systems aren’t something they’re intimately familiar with. Unless it’s not working, it doesn’t get a lot of attention paid toward it. 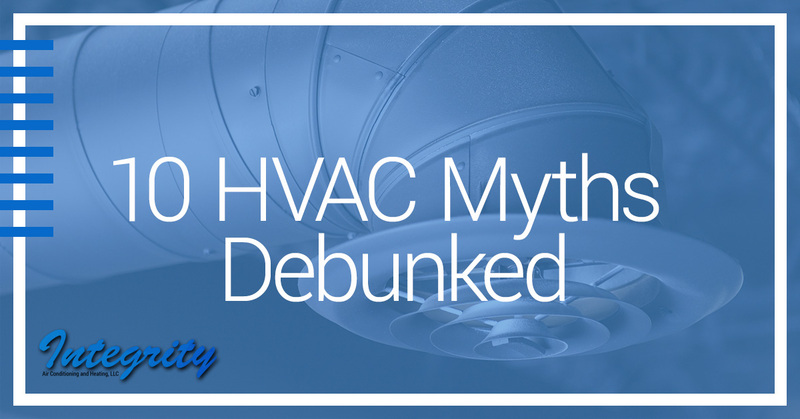 Because of that, a lot of myths have cropped up about the maintenance of an operational HVAC system. Misinformation can end up costing you big time in the long run, so we’ve compiled some of the most common myths about heating and air conditioning with the goal of making sure you’re properly informed. If you think your HVAC system isn’t working properly, call us at Integrity AC and Heating. We are Phoenix’s HVAC gurus. Myth #1: You don’t have to replace air filters often. We’re making this the first entry on the list for a reason; air filters are integral to HVAC systems operating properly. Air filters get clogged up with dirt, moisture, and other airborne particles over time. When they get clogged, your HVAC system has to work harder to pass the air through your home, putting unnecessary strain on the system, which results in repairs being more frequently needed and raises energy costs. Not only that, it will also shorten the lifespan of the system, meaning that, down the road, you’ll have an expensive replacement to consider. Myth #2: You can just replace an air filter yourself. We’ve all been there. We have housework that needs to be done but gets pushed to the side because of our busy daily lives. Take the worry out of the situation by hiring an HVAC professional to replace your air filters. While they replace the filters, they will also be able to check on the overall health of the HVAC system and advise you of any other maintenance that may be needed in the near future. Myth #3: You only need to replace an air filter once a year. Every HVAC system is different due to how large the house is, how much it’s being used, and how old it is. Because of that, there isn’t a good rule of thumb to follow with how often you need to replace your air filter. An HVAC professional will be able to diagnose your system in relation to how much it is used to give you a better idea of how often air filters may need to be replaced. If you have a preventative maintenance agreement, air filter replacement will be included and scheduled for you. Myth #4: Cranking the thermostat all the way up or down will make it work faster. The purpose of a thermostat is simply to regulate the temperature of your heating and cooling system, telling it when to turn on and off, and how hot or cold you want it to be in your home. It has no control over how quickly the temperature will change, only that you want it to change. Think of it this way; an elevator will not get to your floor any faster if you repeatedly press the button. You sent the signal and now the system has to go through its process to answer your request. Myth #5: It takes more energy to start an HVAC system than it does to run it. We’re not sure where this myth came from, but it couldn’t be more wrong. The amount of power required for an HVAC system to turn on is negligible, especially when compared to running the system all day and night, regardless of the temperature. You can save a lot of money simply by harnessing your home’s built-in passive heating and cooling features. It’s recommended you use a programmable thermostat, which will adjust temperature and power depending on your home’s usage along with the passive temperature from day to day. An HVAC professional will also be able to give you further guidance to make your system as economical and efficient as possible. Myth #6: It doesn’t matter where your thermostat is located. A thermostat operates by reading the temperature in its immediate proximity. That means if it is placed in an area with a lot of heat — laundry rooms or near a window that gets a lot of sun — it’s going to think your whole home is that hot. That can result in the thermostat overcorrecting the temperature, which raises energy bills unnecessarily while also making the home very uncomfortable. Placing the thermostat in a neutral area of the home ensures it gets an accurate reading and can, therefore, accurately compensate for temperature. Myth #7: You can save money by closing vents in underused rooms. Sadly, closing a vent doesn’t have an impact on energy costs, as that air is still being generated and pushed toward that room. When that air is unable to escape the ducts, it can lead to larger issues, like leaks caused by pressure being built up in the ductwork. An HVAC system with partitioned climate control can help you control what rooms are receiving airflow and which ones aren’t. Myth #8: Routine maintenance is unnecessary. Your HVAC system is a complex collection of moving parts that need each other to work properly. That means, if one part isn’t working correctly, it makes the whole system’s performance suffer. Just like your car needs an oil change or tire rotation, your HVAC system needs routine maintenance on a regular basis. It will prevent the need for larger repairs in the future and extend the system’s lifespan. Not to mention, a properly functioning system will save you money on your energy bills. Consider a preventative maintenance contract with an HVAC professional to have regularly scheduled inspections to ensure everything is performing the way it needs to and catch any issues before they grow into disasters. Myth #9: A service agreement costs too much money. The truth is, there are many HVAC contractors out there that angle to be the lowest bidder. When they do that, they are often using less trained workers and poor-quality equipment that will break down quickly. A good service agreement with a reputable, experienced HVAC company will ensure you don’t have to worry about equipment failure or inefficient systems due to poor installation. Myth #10: A service agreement is a waste. This myth goes hand-in-hand with the previous one. Many people who believe a service agreement is too expensive also think it would be a waste. When you have a service agreement in place with an HVAC service provider that you trust, you are paying for peace of mind. You don’t have to worry about your system suddenly breaking down, leaving you with no heat. Any cost you believe is being wasted on a service agreement is made up for when you don’t have to consistently replace parts that are failing. Your properly operating system will also pay dividends in the energy cost savings. There is a lot to be aware of when it comes to homeownership, and your HVAC system is one of the most important pieces of the puzzle. Now that you know the truth about these myths, you’ll be more prepared to keep your HVAC system in fighting shape. The first step you should take is to call us at Integrity AC and Heating. Whether it’s routine maintenance, cleaning, or a full system replacement, we’re the experienced HVAC gurus that are right for the job. Call us today for your free quote and be sure to ask us about our HVAC Maintenance Agreements to learn more.